Last week, I had my 28 week scan. I’ve been booked in for scans at 28, 32, 36 and 40 weeks (if I get that far!) in addition to my 12 and 20 week scans, due to having Polycystic Kidney Disease (PKD). I had extra scans during my pregnancy with M, too. Therefore, I wasn’t surprised when the consultant said I’d be needing them during this pregnancy. I find it really difficult to find any information or experiences of PKD and pregnancy. 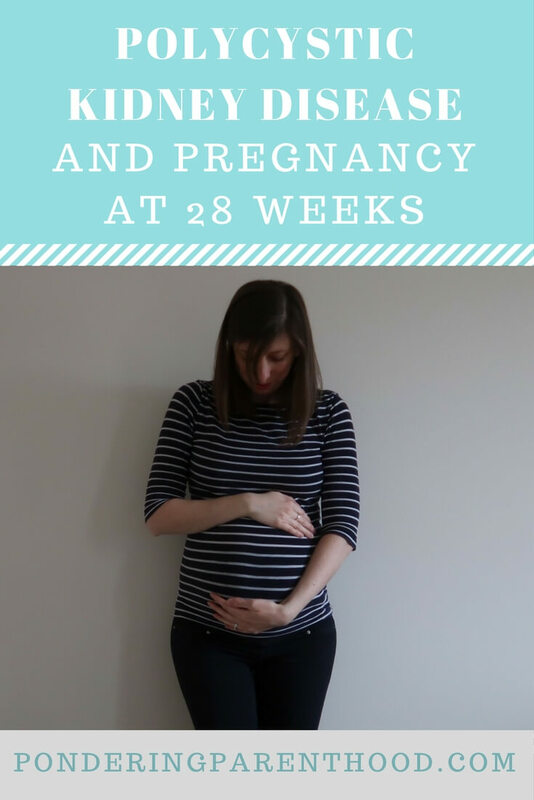 So, I thought I’d write about my experience of Polycystic Kidney Disease and pregnancy at 28 weeks. Why do I need extra pregnancy scans due to PKD? As far as I’m aware, the main reason for needing the extra scans is because PKD brings with it an increased risk of pre-eclampsia. By having the additional scans, the hospital can check the baby’s growth rate and keep an eye on my blood pressure and any protein in my urine, at the same time. Also, as M started measuring small at 32 weeks (she was eventually delivered at 38 weeks), I think they’re extra keen to keep an eye on this baby! 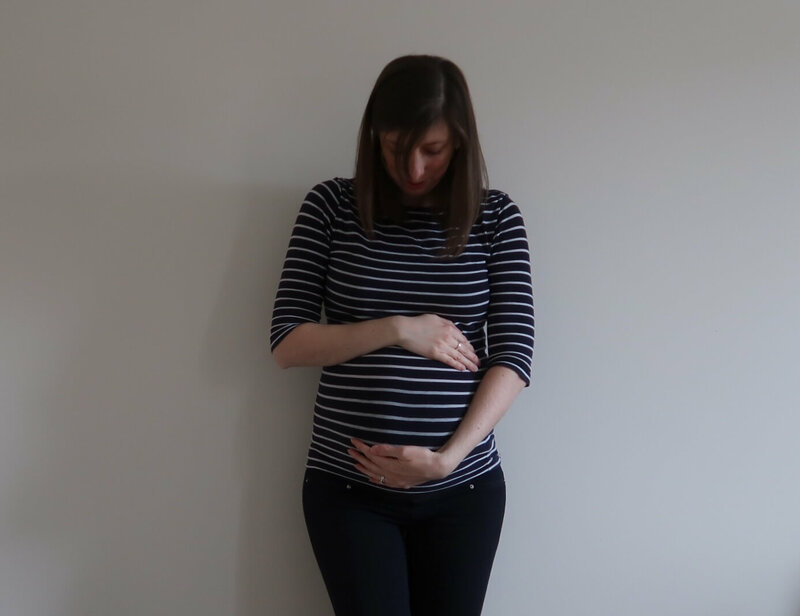 You might remember that at my 20 week scan, I wasn’t very happy about seeing a consultant who seemed far too focused on the baby’s kidneys, to notice that the sonographer had been unable to get a good look at the baby’s head and face. So this time, I was insistent upon seeing my named consultant, who had overseen my pregnancy with M. Thankfully, this time, the receptionist listened and I was relieved to see the right person! My consultant remembered me from my pregnancy with M, and also that my renal consultant hadn’t been at all concerned throughout that pregnancy. As a result, she’s pretty happy with how my kidneys and the baby are doing this time around. We were pleased when she let us know that this baby is measuring within the normal range. Of course, she was in a transverse breech position. This means that she was lying across my tummy, with her feet in her face (a classic M pose!). I’m slightly more hopeful that that baby might manoeuvre herself into a good position though. At 28 weeks, M already had her bottom wedged in my pelvis, head up, with her feet in her face. She resolutely stayed there and was still breech at 36 weeks, hence the need for a caesarean. At least this baby is a quarter turn closer to being the right way around for a VBAC! There’s no reason why, despite having Polycystic Kidney Disease, that I can’t have a ‘natural’ birth. So let’s hope that’s on the cards this time! I’ll keep you posted with what happens at the next scan. "Pondering Playtime // Lost and Found Icy Tuff Spot Activity"